A novel, highly energy efficient and ultrafast magnetization control scheme is successfully demonstrated by international team of scientists from the Netherlands, Germany, and Russia, as Nature Photonics publishes on 3 October 2016. With low-energy terahertz photons the team succeeded to make a magnet wobble in a trillionth of a second. "Our finding addresses the long-term technological ambition of a direct, high-speed manipulation of magnetic data bits by an electric field, which is achieved at terahertz frequencies in our experiment" says Dr. Rostislav Mikhaylovskiy, the leader of the project at Radboud University in the Netherlands. The researchers generated very strong pulses of electric field, which cycle within 1 picosecond, i.e. one trillionth of a second. The corresponding frequency is called terahertz which is one trillion of a Hertz. The terahertz electric field is so strong that it can induce a voltage of a million of Volts in a magnet. Thereby it perturbs the orbital motion of the electrons and deflects the direction of the magnetic anisotropy axis. Importantly, this process happens so fast that the magnetization cannot follow this new orientation. Instead, the magnetization starts to wobble around. The amplitude of the magnetization oscillations scales nonlinearly with the driving electric field. "The first terahertz field induced nonlinearity in the amplitude of magnetization oscillations marks a milestone of photonics on its own," adds Professor Rupert Huber, who led the study at the University of Regensburg. Dr. Mikhaylovskiy explains: "Conventional wisdom has relied mainly on the magnetic terahertz fields which are relatively weak. Ultrafast magnetic recording requires terahertz magnetic fields with amplitudes of dozens of Tesla that is well beyond the current technology. We had a different idea – to use the much stronger electric field for control of magnetic anisotropy. Thanks to the nonlinear scaling of the discovered effect, yet-predicted field thresholds for terahertz magnetic switching may be reduced by an order of magnitude." The work builds on the experiments at Radboud University to switch magnets using light. Electrical switching is equally fast, but much more energy efficient, Mikhaylovskiy explains. 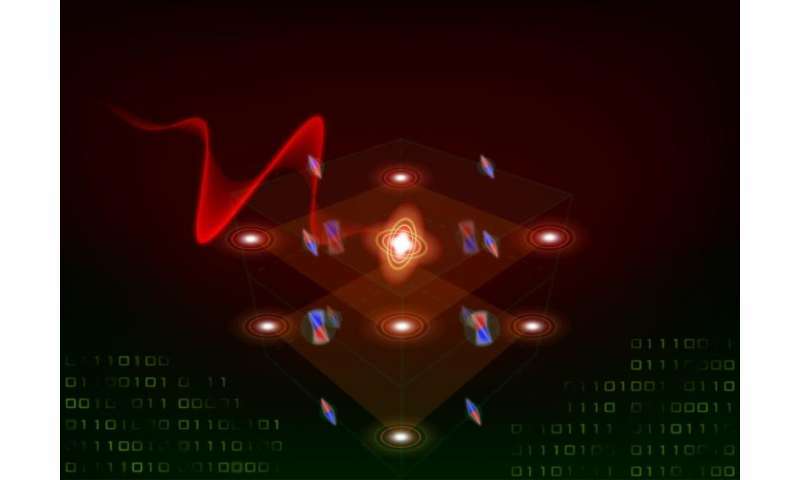 "Here we use low-energy terahertz photons with their energies equal to that of spin and orbital excitations underlying magnetism. To date the light manipulation relied on the use of visible photons with energies of one electronvolt. That is more than a hundred times larger than the intrinsic energy scale of magnetism, which measure one to ten millielectronvolt. He believes that the finding will be applicable in recording devices in the foreseeable future, using high-frequency transistor amplifiers in combination with tailor-cut near-field antennas. "Currently, we are working on attaining higher terahertz fields sufficient for the magnetization reversal using terahertz antennas. Another next step is to perform systematic studies of the ultrafast control of the spin-orbit interaction and the magnetic anisotropy in a broad spectral range, to compare the efficiencies of the pumping in the far-, mid-infrared and visible ranges and thus to identify the most efficient, least dissipative, as well as the fastest approach for the manipulation of spins. The novel finding opens a new research line at Radboud University. The Nijmegen FELIX facility with its free electron lasers in ideally suit for further investigation of terahertz nonlinear control of magnetism. The wavelength of the FELIX-laser is similar to those used in the study. In order to identify excitations allowing even faster and energy efficient switching of magnetic bits, the wavelength of the free electron lasers can be tuned across a very broad range.